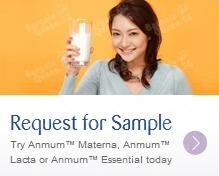 Anmum is giving away free Anmum Materna, Anmum Lacta and Anmum Essential samples, and delivery it to your doorstep for free. Free sample redemption is available via website online request form at link given below. Terms and conditions apply.